Rodney Greenblat: Nintendo Works on Creativity and Originality in Games "24/7"
"Playstation and XBox have little incentive to do that"
Rodney Greenblat is a name likely to be familiar to Sony gaming enthusiasts, as he was the designer and artistic creator for PaRappa the Rapper on PS1, as well as the sequel on PS2. Even those who've staunchly stuck with Nintendo all of these years have probably encountered these rhythm games while playing with friends; they're particularly well known for their distinctive visuals and humour. In a recent interview with notenoughshaders.com, Greenblat argued that a perceived lack of creativity and originality in video games is perhaps the fault of consumers, not developers, and highlighted that Nintendo's approach varies from that of its competitors. I don’t find any lack of creativity in the game makers, but there is a lack of creativity in the game buyers. I think developers would like to make a wide range of interesting games, but they are difficult to sell, so they don’t get made. So it is a problem of economics. The question really becomes how to open up video gaming to a wider audience. Nintendo works on this question 24/7. Playstation and XBox have little incentive to do that. The frontier right now is phones and tablets, but once again it comes down to the buyers. What are people willing to pay for a game on a phone or tablet? Will these fees generate enough income for the publishers and developers? I hope so. Some Wii owners may have come across Greenblat's character design work in Major Minor's Majestic March on Wii, though the game was poorly received and he was less than happy with the outcome; he also admits he's a fan of Nintendo, though those who dislike its 'kiddy' image should look away now. No, I was not happy about MMMM. Pretty much everything went wrong. I could write a book about the compounded mistakes made by hardworking and talented people. Yes, I am a Nintendo fan. Their history and tradition of fun games for kids, family and party games is awesome. What do you think about Greenblat's views on creativity and originality in video games? Is Nintendo the only major console manufacturer prioritizing this, or do Sony and Microsoft do their fair share? Let us know in the comments below. Yet sony has the most diverse line up out of all of the big three. And microsofts xbla platform is really great and they have contents (imagne cup, and dream build play) to reward creative devs. Really conflicted. While it is someone true from a branding perspective I'm kind of bored with non stop mario related titles. Sony spends an absolute crap-tonne on supporting creative, independent studios. Demon's Souls (which Japan Studio assisted) and thatgamecompany are on PS3, not Nintendo. Seriously this is the most ridiculous, factually incorrect statement I have seen made all year. I'm going to assume the developer was quoted out of context, because I like to think most developers are not complete idiots, and I'm gonna give him the benefit of the doubt. All video game companies have elements of originality and creativity and elements of churning out identikit sequels, etc. The problem is there are some people who are very selective in what they see regarding these two sides. A rather unfair fallacy has cropped up in the last few years (ever since the word "innovation" was hijacked post-Wii/DS) that only Nintendo is allowed to be innovative (for example Sony already had a motion control device on the market with the PS2 Eye Toy, but because Nintendo didn't make it, it has been all but wiped from history as it doesn't quite fit in with the "Nintendo introduced motion control with the Wii/no one else is as innovative" line). Also, when other companies make very similar sequels they're "lazy" and "creatively bankrupt", but when Nintendo does it they're "sticking to a winning formula" and "not fixing what ain't broke", etc. Nintendo are incredibly innovative and creative, but they don't have the monopoly on it. How I read what he said is that Nintendo focuses on bringing its software to the masses, while Sony/Microsoft aren't. @Sony_70 Sony? Diverse? You're kidding, right? Because Nintendo DID have motion control before Sony: the Power Glove. I remember the Eyetoy, and I still say Nintendo had motion controllers first. However I do say that Sony had controller-less motion first, unless you count that one IR peripheral for NES, in which case the first one to do that was a third party that made something for Nintendo, much like Kinect was made for Microsoft. And whoever said Sony was the most diverse... BWAHAHAHAHAHAH!!! I've played both Nintendo and Sony, and I can say Sony's not as diverse. More than Microsoft at least. Yeah the Power Glove was made by Mattel, not Nintendo. But of course I'm not saying that the Eye Toy was the first motion control device, it most certainly wasn't, just used it as a prime example of how other companies' innovation and creativity is often swept under the carpet by some Nintendo fans. Nintendo plays as safe as any big game game company pretty much; otherwise why the spamming of the NSMB series. I would assume it's either the newer Nintendo fans who would do that, or the kind that never went outside or watched TV. Eyetoy, as far as I know, was promoted heavily by Sony and I used to see it whenever I went to Fry's Electronics or Best Buy. Power Glove was Mattel huh? Seems like it was heavily advertised by Nintendo through that one movie which I will not name, and wasn't it a licensed product anyway? Still not made by Nintendo, I got that. Falls into the same category as that one controller-less Infrared peripheral for NES that I can't remember the name of, but more well known. Sony, Diverse? Now that's the laugh of the day. to Mario in his 8-16 bit days. @Aviator - Yes, because they're not just gaming companies. That doesnt make them superior when it comes down to the games though. I would agree that Nintendo are good coming up with original games. Recently they've definitely had some let downs. The NSMB series needs to die ASAP. @Reala Don't forget the original series was also as you put "spammed"
The original NES series spammed? ok.......... felt like very different game series to me each game though especially how Western releases where handled. Now that I think about it, Nintendo have been creative when it comes to their IP even with game sequels and "spin-offs". Kirby is one of the top I can think of when it comes to new types of gameplay that is different from one to another. You weren't around during the NES era were you? I think everyone is mixing up the messages of creativity and extending the audience. He quite clearly states that he see' no lack of creativity in any of the game makers. Rather he sees a lack in the demand for anything new in their respective audiences. A majority, not all, there are always exeptions, but a majority of them what what they have but bigger or better. He is applauding Nintendo not for being more creative per say but for reaching out to more than their current audience by saying - this isn't the same thing everyone else is doing give it a try. by doing that you are "reaching a new audience that doesn't have the same predetermined expectations of what their games should be like. Now you can introduce new concepts with an audience that is expecting something new not the same but bigger. That is a risk that few companies are willing to take. When the Wii came out everyone said it was underpowered and couldn't make the next bigger better game. That's not what Nintendo was trying to do, I don't think. They took a bashing from current game players who say the system wouldn't provide bigger and brighter, but at the sames time opened a new audience who found out they might enjoy games afterall. Thus game the mini games, the dance games, the resurection of group games. new as he noted the phone and tablet market are similar. You have a new audience without the preconcieved expectations of what a video game should be so you can introduce newness with less risk, because to the audience almost all of it is new.. Releasing dozens of games with "Mario" in the tile is super creative, apparently. Releasing dozens of games with "Call of Duty" in the title is super creative, apparently. His point about Nintendo working on this question 24/7 is because they're a games maker, only, while Microsoft has computer software, tablets, phones, etc., and Sony has TVs, cameras, music players, eBooks, etc. He's not dissing PS3 or XBox 360, just stating a fact. Also: I've been intrigued by MMMM for some time now, if only to see its whimsy and art design. But is it really that bad? Not worth the $5 used you can find it for? Now that the artist himself says it went wrong, that makes me less inclined to check it out. It's pretty amazing how this site can interpret quotes like that to mean entirely different things. He clearly said that what Nintendo is working on 24/7 is "opening up gaming to a wider audience". Also known as casual gaming. I see you're going with the straw man. Flawless logic. @The_Fox I see you didn't read the article properly. Instead of pointing out someone's lack of an argument maybe you should work on your own first. "I don’t find any lack of creativity in the game makers, but there is a lack of creativity in the game buyers." This quote easily shows that he isn't singling out Nintendo for their creativity from a game making perspective. In fact, further down in the article he mentions that Nintendo works on the issue of expanding the market. Nowhere does he specifically say Nintendo is more creative than the other companies from a game development perspective. Actually, this seems to be mistake a lot of the readers on this page have been making. Only a few seem to have noticed this. "The question really becomes how to open up video gaming to a wider audience. Nintendo works on this question 24/7. Playstation and XBox have little incentive to do that." The article headline paraphrases and includes the wording 'Creativity and Originality', which honestly is very different than the quote above and is causing a lot of the confusion. Opening up to a wider audience simply means promoting and pushing genres equally across the board (with some new ideas here and there to draw in the non-gamer). Not to be made as a general statement, but when I ask my PS3 and XBox 360 owning friends and family members, nine times out of ten they are currently playing one of three genres: FPS, Western RPG, or Cinematic Action/Adventure. Occasionally I hear racing and sports, but for the most part the first three dominate the genres selected by my (limited) sampling pool. That's not to say that PS3 and XBox 360 lack a variety of genres to choose from (which they have a wide selection for sure), but I rarely hear games like Journey or Catherine being mentioned by the face to face general populace. Nintendo gamers (either by choice or by necessity) generally own a wider variety of genres, since they can't rely on the big budget third party titles that the HD consoles get. This leaves the door open for Nintendo to market towards a broad (and sometimes niche) audience (see Nintendo published titles like Endless Ocean, Sin & Punishment, Fortune Street, as well as their own developed titles Punch Out, Smooth Moves, and Rhythm Heaven Fever), which result in a variety of titles Wii owners will purchase (again, almost in necessity due to lack of the big name third party titles). So that is my take on it, Nintendo consoles and handhelds are easier markets for lesser third party titles to penetrate, and Nintendo follows suit by publishing / developing games that normally would not get attention otherwise. PS3 and XBox 360 already have a good market pull in the aforementioned genres, so in turn Sony and Microsoft's products go along with the demands of that market. A classic example of you see what you want to see, and you hear what you want to hear. All the fanboys of the different consoles could show evidence of their favorite console being more "creative and original" in comparison. @The_Fox Okay then. Well I really think someone should point out that the title is extremely misleading. Apparently you didn't go that route when you could have called it out. @Thomas Whitehead You should really change that title for the article, it's confusing a bunch of the people looking at the article. It's also flamebait and I really hope that wasn't your intention. Agreed, the title is very misleading. sony smash bros looks awesome! "Yeah... I know... I gotta BELIEVE!" BTW - Rodney does some seriously fun artwork outside of the NanaOn-Sha games, it's well worth checking out! I've had various works of his as my computer desktop background for years! I gotta be honest, this could have been so dumb. It was nice to see this guy really knows what he's talking about in every possible way. 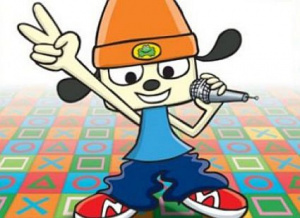 Good for you, Parappa art guy. Yep, now I'm starting to get confuse on what the main point is. Is it Nintendo creating a system that draws in gamers of different variety because of the way it is design, buyers are less drawn to new ideas and more focus on existing IP and sequels that developers want to play it safe and just improve, or Nintendo creates games that is unlike what others are doing? I hope Rodney chooses to continue working on Nintendo Games, he may have messed up with MMMM, but give him some more time and an experienced production team and who knows? Wow, people praising PaRappa and the Eye Toy? Now all we need is someone to claim the Virtual Boy was awesome and then the apocalypse can get underway. This is why I don't spend much time with HD consoles. It seems like every game I pick up is directed to the same audience, i.e., not me. With Nintendo, I have no problems finding games I like. I think people are misinterpreting what this guy is saying. He's not saying that game creators have any lack of creativity, that's Sony, MS, and Nintendo. He's saying it's the BUYERS that have the lack of creativity, they don't want to buy into new game idea's or IP's. His point about Nintendo is that they don't cater directly to what the consumers want, for the most part. Everyone knows that Nintendo has that "we know what's best" attitude, and that's what he's saying. Sony and Microsoft simply give consumers what they want, letting THEM choose what kind of games are made. "Their history and tradition of fun games for kids, family and party games is awesome." No... This is the common mistake that I seem to be finding far too often nowadays, especially since the Wii's "kiddy" (family-friendly) image broke out. Nintendo does not make games for kids; they make games for everyone. Anyone and everyone can pick up their games and just have a blast. A proper game dev would realize that. @Gamesake You make it sound like PaRappa was a bad game. It is very common to see that new, daring ideas never sell as much as they should, so Rodney is right on the money. Clover Studios is a great example of this. The thing is that since now games are more and more expensive to make they need to sell even more copies to break even, making it harder for some developers, which explains why the innovative, indie games usually appear in downloadable format. I would love to see a new music game from him, I have very fond memories of Parappa, as frustrating as it was sometimes. @sinalefa Another reason I play more SD than HD! The latter is more expensive. All three seem pretty much equal on the digital side of things but to me Nintendo is usually more creative and diverse on the retail side. They tend to make a game then market it by going around telling people "heres why you should play this" while Sony and MS basically do the opposite. Not that you can blame them after all its risky going off the beaten path, and its not their fault Sony and MS fans just seem to have a different idea of what a game is supposed to be. Its not that they're the first to do anything but they tend to be the ones who popularize it. Motion control, touch screens, dual screens, they were all brought into mainstream gaming by Nintendo. I totally saw him signing books a few months ago. And I also totally know that he signs his personal emails "Fun+1", which is the coolest motto ever. Also, I like what he has to say. Hey @sony_70, too bad microsoft doesn't create those XBLA games and sony's library isn't diverse at all. I mean how many games DO they actually make?? As long as sony keeps digging through Nintendo for inspiration, there will always be people in denial of creativity. GIVE credit where it's due. oh yeah P.S. Nintendo is also the only developer to bring new hardware experiences along with software to prove it's point. Who else has done that in the past 10 years? Last line i wanna hate him and ef him in the night. Ummm, yup. He pretty much hit the nail on the head. Nintendo is more creative with the hardware then with the software! I mean, whatever controller of peripheral they create, it's always used for a Mario or Zelda! Sure they do lot's of different things with Kirby, wich is cool! But in the end it IS Kirby! Nintendo plays it VERY safe nowadays, by relying that much on already existing franchises!! But I guess it wouldn't be that bad if Nintendo attracted all good titles that you also find on Xbox360/PS3 (download titles included), but they don't! !